How do you make a Lego Mindstorms robotic kit solve puzzles independently, without the need of an aid computer? Just ask Hans Andersson, the designer behind the Tilted Twister, an autonomous robot which was made using nothing but pieces from the Lego Mindstorms NXT kit. A set of ultrasonic sensors detect when you place the Rubik’s Cube on the Tilted Twister. 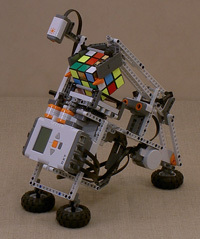 The Lego bot can then calculate the moves needed for a solution and executes the proper movement. And the coolest thing about it all? It does this all on its lonesome. The Tilted Twister flips the cube around to scan each side using a HiTechnic sensor color detection system. The real challenge was creating an algorithm that both complied with the NXT’s computing capabilities and didn’t take years to finish. Lucky for Andersson, he’s figured out a way for the whole process to be finished in an average of 60 moves. The whole solving process takes about 6 minutes total. While it might not be a pure speed demon, it’s pretty impressive what some people can do with nothing more than a set of Legos. For a more in-depth look at the Titlted Twister and for your own building instructions, check out the official website.